The AIAS has partnered with Blank Space to put on the 2017 Fairy Tales Competition. After the record-breaking success of last year’s competition which drew over 1,500 participants from 67 countries, Blank Space is excited to announce that the 2017 edition is open for registration. Now in its fourth year, Fairy Tales is the largest annual architectural competition in the world. Blank Space has partnered with the AIAS along with the National Building Museum, Archdaily, Archinect, Bustler and Design­Milk. The competition will be capped with a special celebration at the National Building Museum in February 2017 for all winners, participants, jurors and VIPs. Fairy Tales is open to all and invites architects, designers, writers, artists, engineers, illustrators, students and creatives to submit their own unique architectural fairy tales. A successful entry crafts a text narrative, along with 5 images, in the most spectacular way possible. This year’s entries will be reviewed by some of the most influential authorities in architecture, design, storytelling, and business. The jury includes our very own President and Vice President, Sarah Wahlgren and Rachel Law, amongst others: John Maeda (Kleiner Perkins Caufield Byers), Dan Wood (WORKac), Chase Rynd (National Building Museum Director), Martin Moeller (National Building Museum Senior Vice President and Curator), Michel Rojkind (Rojkind Arquitectos), Antti Nousjoki (ALA), Sarah Balmond (Balmond Studio), Marion Weiss (Weiss/Manfredi), Michael Maltzan (Michael Maltzan Architecture), Jing Liu (SO­IL), Alan Maskin (Olson Kundig), Minsuk Cho (Mass Studies), Michael Van Valkenburgh (Michael Van Valkenburgh Associates), Robert Hammond (The High Line), Gro Bonesmo (Space Group), Stefano Boeri (Stefano Boeri Architetti), Alexander Walter (Editor in Chief of Bustler), Becky Quintal (Executive Editor of Archdaily), Matthew Hoffman and Francesca Giuliani (Blank Space Founders). Participants can register for a $40 Early Bird Discount until Wednesday, September 14. Following that, Regular Registration ($60) will be open until November 2, and Late Registration ($80) until the Submission Deadline on December 9, 2016. 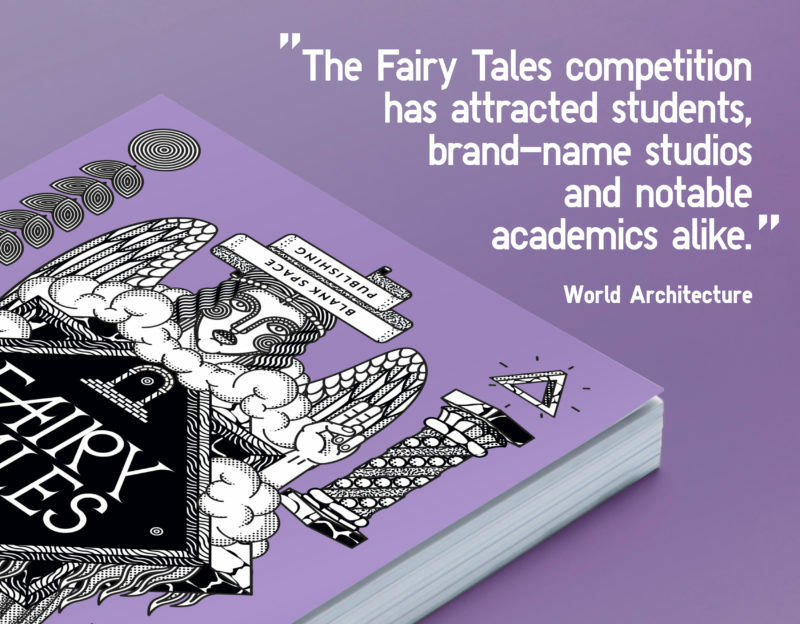 Any AIAS member that registers for the Fairy Tales competition will receive a free copy of the newest Fairy Tales book – which includes 25 beautifully rendered architectural Fairy Tales. Information will be in your membership benefits email. FAIRY TALES: VOLUME IV: The life of the submissions doesn’t stop at the conclusion of the competition. Following the competition, Blank Space will publish the fourth volume of “Fairy Tales: When Architecture Tells A Story.” Select entries will be included in the book, as well as featured prominently on the Blank Space website. The book is sold at museums and bookstores around the world including The National Building Museum, The Museum of Modern Art (MoMA), NAi Booksellers and the Museum of Contemporary Art, Los Angeles (MOCA).